Several months ago, the Queens Library system was in a state of disarray. Its former leader, Thomas Galante, who served as president and CEO for more than a decade, was plagued with scandal. He was fired in December 2014 for his excessive spending habits, including tens of thousands of dollars on his corporate credit card on dinners, concerts, and sports memorabilia. He infamously spent $140,000 to renovate his private office, including adding a $27,000 smoke deck. After firing several board members, the Queens Library system had to bring in new leadership to steer the ship back on course. That’s when they hired Dennis Walcott. Walcott came into the position this past March with a lifetime of public service experience. He served as schools chancellor under Mayor Michael Bloomberg from 2011 to 2013. Before that, he was deputy mayor for education and community development in the Bloomberg administration. Although he lacks a formal background in the library field, Walcott was raised in the system. He got his first library card at the St. Albans branch while in elementary school. He graduated from Francis Lewis High School, then got his bachelor’s and master’s degree in education from the University of Bridgeport in Connecticut. He later went back to get a second master’s degree, this time in social work, from Fordham University. 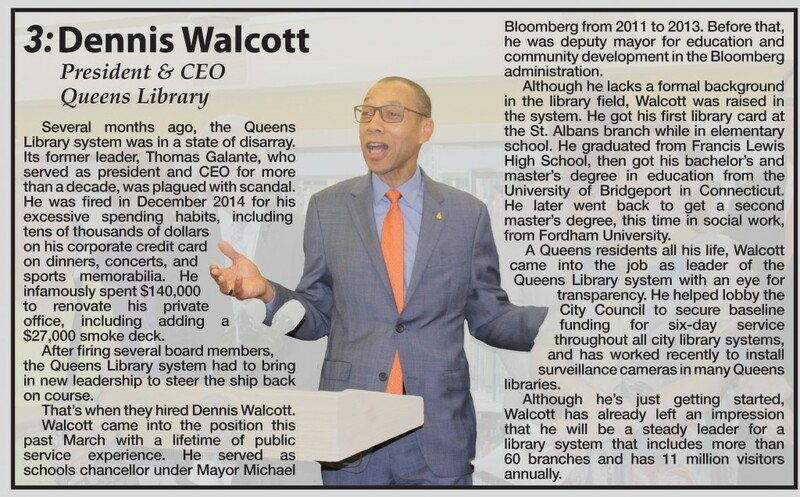 A Queens residents all his life, Walcott came into the job as leader of the Queens Library system with an eye for transparency. He helped lobby the City Council to secure baseline funding for six-day service throughout all city library systems, and has worked recently to install surveillance cameras in many Queens libraries. 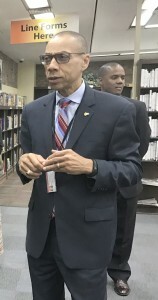 Although he’s just getting started, Walcott has already left an impression that he will be a steady leader for a library system that includes more than 60 branches and has 11 million visitors annually.